If the glory of a owning a skill cape was not reason enough for you to regularly take it out of your bank, we've given each cape a small perk to make them that bit more useful! Since their release skill capes have been a great way to show off your accomplishments in RuneScape, but as great as they look they haven't always been the most useful items. In an effort to give you more reasons to show off your accomplishments more regularly, we have added perks to each of the skill capes in game. Attack Free access to Cyclops area found upstairs within the Warriors' Guild. Strength Unlimited teleports to the Warriors' Guild. Defence Act as a permanent Ring of Life. This effect can be toggled. Ranged Act as an Ava's accumulator. Prayer Act as if you are carrying a holy wrench (this does not stack with the holy wrench or ring of the gods). Magic Can cast spellbook swap once per day. Runecrafting Acts as all tiaras. Construction 5 daily teleports to any player owned house portal. Hitpoints 2x HP restore rate (does stack with regen bracelet, doesn't stack with rapid restore prayer). Agility Acts as a graceful cape, including weight reduction and set bonus. Herblore Nardah herbalist will create unfinished potions for you, for 200gp each. (Same as desert hard reward). Also gives a pestle and mortar. Thieving 10% better chance of succeeding when pickpocketing. Crafting Unlimited teleports to the Crafting Guild. Fletching Can be searched for a mithril grapple and bronze crossbow 3 times per day. Slayer Slim chance of being able to persuade a slayer master to reassign your last task. Hunter 5 daily teleports to black or red chinchompas. Mining 5% chance of receiving an extra ore while mining, up to adamantite (stacks with Varrock armour). Smithing Acts as goldsmithing gauntlets. Fishing Unlimited fishing guild teleports. Cooking Impossible to burn any food. Firemaking Acts as a lightsource. Woodcutting 10% increased chance of finding a bird's nest. Farming 5% increased yield from herb patches (stacks with magic secateurs). Max cape Provides all of the above (unless combined with another cape, in which case no perks are provided). The PvM Arena has returned for this year's Clan Cup! Clans participating in the tournament will be able to face-off in this head-to-head PvM battle, taking down boss after boss after boss. Two teams enter the arena with one goal: get more kills than the other clan in one hour. Worlds 317 and 321 have been reverted from Deadman worlds to Old School worlds. Worlds 318, 325 and 337 have been returned to where they were originally hosted. 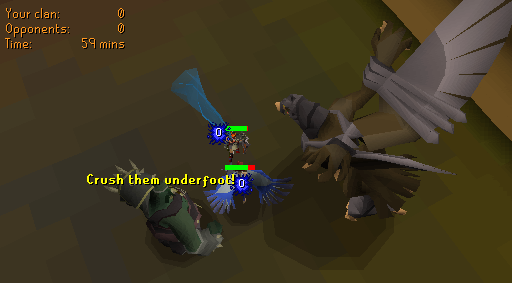 The one tick delay present when you used the Port Phasmatys bank booths rather than bankers has been removed – on top of this, one of those booths was not giving a message for players not using an amulet of ghostspeak; this has been fixed. A problem where attack options were being hidden has been resolved. A typo in the Varrock diary interface for the spelling of 'Paddewwa' has been fixed. Information given in the tutorial about Deadman mode has been updated to reflect the changes made to death and XP loss. The message received when failing a stepping stone shortcut is now correctly filtered. When removed from the Wilderness resource area by Mandrith, the game message no longer states that you must pay again to regain entry if you have the elite Wilderness diary complete. It is no longer possible to enter the closet in Draynor Manor when skulled on a Deadman world. When purchasing battlestaves as part of the Varrock diary reward from Zaff's barrel, you will no longer be told your inventory is full when it already contains a stack of noted battlestaves. Ouch you should fix how that table looks on the update page. I spoke to you a while back about the current world hopping system / to many login attempt errors. Pking on OSRS has died out quite abit with the realease of Deadman and when my team goes out and Pk's we hop around a few worlds finding barley anyone and within a couple of minutes we all get the "to many login attempt error". Can we please just get this removed so we can hop around without spending most of our time sitting in the lobby waiting to get back into the game. Appreciate all the good work you and your team do for Oldschool. strength cape is still useless.